Hyksos - Who were the Hyksos? Sometime after 1800 B.C. 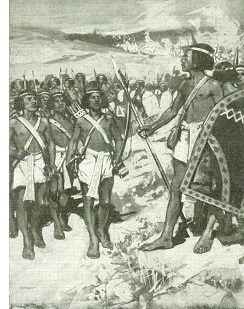 Egypt was invaded from the northeast by nomadic people from Western Asia. The native Egyptians called them Aamu which Egyptologists have translated as "Asiatics". Josephus, the first century Jewish historian, claims Manetho, was the first to use the word "Hycsos" to describe these invaders; a word which has stuck to the present. Manetho, who lived during the Ptolemaic period, wrote an extensive history of Egypt. However, his work does not survive today. Josephus attributes the translation "shepherd kings" to his description of these people, but this has been determined to be a mis-translation. Modern historians speculate that Manetho may have used the term hikau khausut, which means "rulers of foreign countries". They established a capital at Avaris on the Eastern side of the Nile Delta and became Egyptian in almost every way. They adopted the language, customs and religion, but never fully gained the acceptance of native Egyptians who regarded them as foreigners. After nearly two and half centuries, the Egyptians forced them out and regained control of their land. The reign of the Hyksos represents the Second Intermediate period between the Middle and New Kingdoms.